Were you able to guess the place and time of the photo below? You are looking at a congested Easton Ave. (now Martin Luther King Dr.) in the late 1940s as a #32 Wellston bus and a streetcar exit the Wellston Loop. The loop was the terminus for the trolley line at the city limit, where the streetcars would turn around and head back downtown. Also prominent in the shot is Katz’s Drug Store occupying the Nugent Building dating from 1928, the former home of Nugent’s department store, a retail landmark in the neighborhood for many years. The last trolley run on the Hodiamont Line was on May 21, 1966. 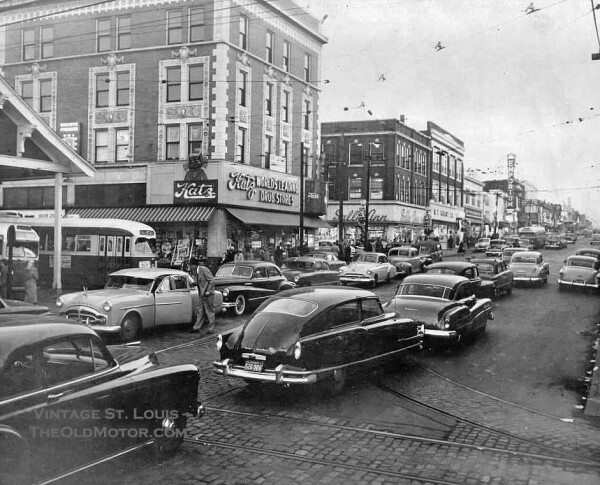 Photo courtesy of Vintage St. Louis. The #32 Wellston Line was still running streetcars in the 1940’s, almost until 1960. The streetcar shown on the picture was most likely a #32 Wellston streetcar. The bus shown next to it was likely running a different route. I used to ride on the #32 Wellston streetcar to get to the Wellston Theater during the late 1950’s. I would guess the bus was a 94 Page bus. The bus coming west on the street was probably a 16 City Limits bus. The building with the Katz drug store was the LOOP BUILDING. The facade from over the main entrance is in the City Museum today. Steve, I’m on board with your thoughts regarding the buses. I might pay a visit to the museum to view the façade; it’s a reflection of a great transit system that once existed in St. Louis. Facing east, in the area where the bus is heading towards The Loop, was once a vibrant commercial strip.